A full-scale, destination resort tucked away on 300 tree covered acres in northwestern San Antonio. Including a 500 room hotel, 40,000 sq ft meeting space divisible into 27 flexible meeting areas, including five meeting rooms and two magnificent ballrooms, 14,500 sq ft stand alone full service spa and 27-hole championship golf course, tennis court and 4 acre water playground with a 950 ft Ramblin' River. 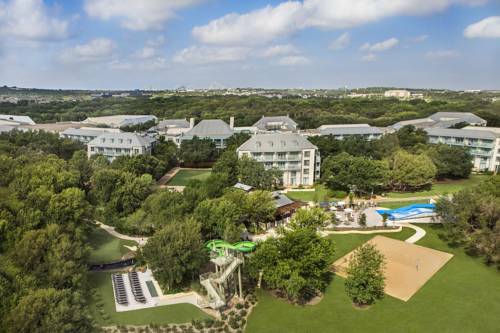 Hyatt Regency Hill Country Resort is located 20 minutes from the airport and the heart of downtown, 15 minutes from Six Flags Fiesta Texas theme park and 1 mile from SeaWorld San Antonio. Savor the eclectic flavors and welcoming ambiance you'll experience at our signature San Antonio restaurant. Reservations are suggested. Make your reservations at www.opentable.com. AAA Four Diamond. Our 19th hole restaurant offers a restful retreat, whether you are golfing or simply enjoying the gorgeous view of the rolling Hill Country. What could be better than a store filled with treats for one and all? Whether your vice is chocolate or coffee, sandwiches at 10pm or souvenirs for your collection, you'll find it all at the General Store. ~44 miles from San Antonio.